WEMCO attrition cells achieve the strongest possible attrition of particle surfaces without reduction of particle size. 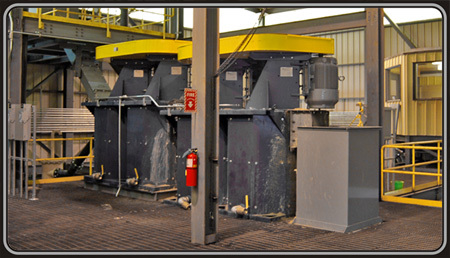 The Wemco Attrition Cells are highly efficient due to alternating reversed pitch impeller blades and Downcast/Upcast direction of flow causing a uniform action with the particles themselves doing the work. In designing the machine, the object was to achieve the strongest possible attrition of particle surfaces without reduction of particle size. This was done by introducing the feed at high density, 70 to 80% solids in the case of sand, with a consistency approaching concrete mix. Then, in place of simple rotary motion of the pulp, the agitation was made turbulent by reversing the pitch of alternate sets of impeller blades, and folding of the pulp was induced by making the tank octagonal shaped instead of circular. The result was a powerful attrition action, with the particles themselves doing the work by rubbing against each other and the machine providing the impulsion. The attrition action was repeated in a series of cells, each with impeller and drive, to give the necessary time of treatment. Efficiency is high because a major portion of the energy supplied goes into friction between the particles, which in this case is the desired action. Sound particles are not reduced in size; there is no impact or grinding action present as in a grinding mill of any type. The only degradation that takes place is that of soft particles or cemented materials, which is a desired effect on feed containing either of these. Contamination of glass sand by iron particles abraded from the impellers or tank is easily avoided by using rubber-covered paddles and tank liners. Likewise, the machine can be acid proofed by using stainless steel fasteners and rubber covered wetted parts. Using materials suitable for the feed attains high abrasion resistance. For excessively abrasive feed with coarse, hard particles, urethane or rubber covered paddles and rubber covered tank liners are used. The necessary retention or treatment time can be obtained by using any number of cells in a bank; up to six. In this way, the material is treated for only the time required, with a saving in installation and operating costs. The machine is compact, requiring a minimum off floor space and headroom. The machine is simple to install and operate, requiring no attention other than control of feed density and occasional lubrication. The overall direction of flow is downcast in odd numbered cells, upcast in even numbered cells, with ports between cells. With this arrangement, no material can short circuit from one cell to the next. All material is treated uniformly for the required time. After treatment in the attrition machine, the slimes formed by scrubbing of surfaces or dispersion of soft particles are readily washed out by other types of treatment units downstream.